Our Cherry Pit Aromatic Heating and Cooling Pad will be your "Must Have" all natural therapeutic way of healing and soothing many ailments. Cherry pits have the ability to release moist heat slowly and transmit a cold application longer. Our Cherry Pit Aromatic Heating or Cooling Pad can relieve arthritis pain, muscle cramps, back pain, tired and sore feet, menstrual cramps, headaches, sinus congestion and aching joints. Any kind of discomfort can be soothed and relieved by using our Cherry Pit Aromatic Heating or Cooling Pad to generate warmth and softness that helps keep muscles and joints limber. Premium Michigan grown tart cherry pits have large round hollow cores which naturally retain and conduct heat and cold longer than any other natural product. Fresh cherry pits are collected during our July cherry harvest season. The fresh cherry pits go through a rigorous cleaning process as they are scrubbed, dried and moisture tested then stored in moisture proof containers. We add a few drops of “just picked” botanical fragrance of lavender essential oil to our cherry pits to create an aroma therapy ambiance that comforts and soothes your senses while relieving your body pain and ailments. Heated cherry pits are long lasting toasty warmers for your feet, hands and bed sheets too! Cold cherry pits will relieve the discomfort of hot flashes, headaches and swelling. 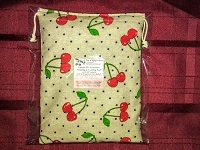 Our Cherry Pit Aromatic Heating or Cooling Pouch is made up of a soft touch material. You can wash the outer cover when needed. Just a little hand washing in cold water then hung to dry will do the trick. For warm moist heat…microwave initially for 1 minute. Microwaves do vary in power so the heating time might need to be increased by 20 second intervals until your desired warmth is acquired. For a cold compress…place in an enclosed plastic bag and freeze for two hours. Copyright A Taste of Michigan Cherries. All Rights Reserved. powered by 3DCart eCommerce Website builder.